48g/km for new UK electric car | What Car? Gordon Murray Design has released performance targets for its T.27 electric car, with running prototypes expected by next April. The company says the car, which is shorter than a Smart Fortwo but seats up to three, will have an 80-100 mile range and emit the equivalent of 48g/km based on a UK energy mix. It will have a top speed of 65mph and get from 0-62mph in less than 15 seconds. Around town, Gordon Murray Designs says the T.27 will emit 28g/km, while the full lifecycle environmental impact, including manufacturer and disposal, will be 42% less than the average UK car. The T.27 is based around the T.25 city car concept which, like Gordon Murray's McLaren F1 supercar, puts the driver in the centre of the car and two passengers set back to either side. 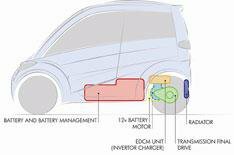 Gordon Murray Design has also shown how the 12kWh li-ion battery and 25kW electric motor powertrain, developed by partner company Zytek, is small enough to be packaged under the floor. That would leave the company free to retain the T.25's seating, which has six different layouts. The vision is that both cars would be built using the iStream assembly process which, Gordon Murray Designs says, 'could potentially be the biggest revolution in high volume manufacture since the Model T.' The simplified process aims to take up 20% of the space of a traditional plant and would require 80% less capital investment.